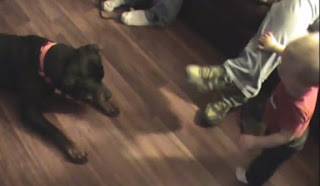 Rottweiler Protecting Baby From Evil Shadow !! Amazing Rottweiler trying to protect this little baby from the "evil moving shadow" on the floor. His name is Rambo, and he seriously doesn’t like shadows that much! So when Rambo sees a moving shadow near the baby, he had to get the shadow! Rambo will do anything to make this baby have adorable laughing reactions. Baby can't help him but is having a lot of fun while Rambo makes his role as the real superhero.